925 silver Chain bracelet Fresh Style Fast Delivery. 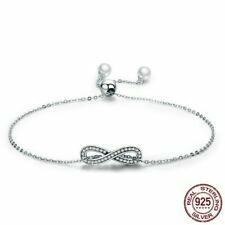 Fastened with a sterling silver lobster clasp, this adjustable bracelet is punctuated by a beautiful infinity symbol which is embellished with glittering white cubic zirconia to make it truly eye-catching. 18K white gold filled is not to be confused with white gold plating as filled literally has 100% more white gold than white gold plating. White gold filled is much more valuable and tarnish resistant. Chain Type: Snake Chain. - 925 Sterling Silver. An alloy of silver containing 92.5%. Material Type: 925 Sterling Silver. Featured Category: Charm Bracelets. Clasp Type: Lace-up. Style: Chain, Link. - Pave Setting CZ. Rose gold filled is not to be confused with rose gold plating as filled literally has 100% more rose gold than rose gold plating. Rose gold filled is much more valuable and tarnish resistant. Material: 18k Rose Gold Filled. We have our own factory, We can help you customize product.925 Sterling silver,Stainless Steel,White Gold Filled,Yellow Gold Filled ,Rose Gold ,Ring ,Earrings,bracelet,necklace. Chain Length:24cm. It's a perfect accessory, also a good gift to your friends It will make you beautiful on picture. 1 x 9 25 Sterling Silver bracelet. Charm size: 2.4 1cm. Material : 925 s terling s ilver(stamp S925) with rhodium plated. Bracelet length: 15.5cm 2.5cm extender (6.1" 0.98"). However, we will try our best to minimize it. Material: 925 Sterling Silver. Weight: 3.2g. We have our own factory, We can help you customize product.925 Sterling silver,Stainless Steel,White Gold Filled,Yellow Gold Filled ,Rose Gold ,Ring ,Earrings,bracelet,necklace. Our warehouse is located in Yiwu, the largest small commodities market in China. 18 K Rose Gold Filled Weight : 5.6 g. The color of photos may vary from different monitor. We also try our best to show the material in a colour that is as close as possible to the original, all our photos are made using light that is as close to natural as possible and avoid color variation. 18 K Rose Gold filled is not to be confused with Rose Gold plating as filled literally has 100% more Rose Gold than Rose Gold plating. Rose Gold filled is much more valuable and tarnish resistant. 18 K Rose Gold Filled. Material : 925 s terling s ilver(stamp S925) with rhodium plated. 1 x 9 25 Sterling Silver bracelet. Charm size: 2.2 0.8cm. Bracelet length: 23.5cm. However, we will try our best to minimize it. Shenzhen Hengfeng Technology Co., Ltd is located in Shenzhen, China. The color of photos may vary from different monitor. We also try our best to show the material in a colour that is as close as possible to the original, all our photos are made using light that is as close to natural as possible and avoid color variation. We have our own factory, We can help you customize product.925 Sterling silver,Stainless Steel,White Gold Filled,Yellow Gold Filled ,Rose Gold ,Ring ,Earrings,bracelet,necklace. It's a perfect accessory, also a good gift to your friends It will make you beautiful on picture. 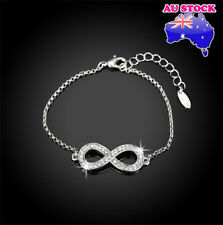 This is a beautiful and unique INFINITY bracelet is made of 925 Sterling Silver and paved with cubic zirconia crystals. INFINITY SILVER BRACELET. Infinity length: 0.6 ". Bracelet length: 6.9" 1"extension chain. Silver filled is not to be confused with silver plating as filled literally has 100% more silver than silver plating. Silver filled is much more valuable and tarnish resistant. Stone: Cubic Zirconia. Material: 100% 925 sterling silver cubic zirconia. Length: Adjustable. A durable yet delicate silver bracelet, this piece of infinity jewelry is on trend. The heart is symbolize sense as the center of emotion, especially romantic love. Together with the infinity it represents strength within a boundless unity, connection and world. Trending at C $47.54eBay determines this price through a machine-learned model of the product's sale prices within the last 90 days. The heart is symbolize sense as the center of emotion, including affection and love, especially romantic love. Together with the infinity it represents strength within a boundless unity, connection and world.